Flame Writer: The Booker Award!! 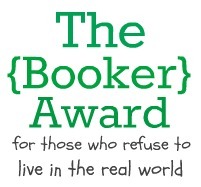 "The Booker Award goes to "...those who refuse to live in the real world." (*Raises hand*) To receive this award, the blog must be at least 50% about books (reading or writing is OK). Along with receiving this award, you must also share your top five favorite books. (More than five is OK.) You must give this award to 5-10 other lucky book blogs you adore." THE BOOK THIEF by Markus Zusak. The plot, the characters, the setting, just everything about this book makes my jaw drop down to China. The first time I read this book I was just overwhelmed by the beauty the protagonist makes out of her life in Nazi Germany, and the horrors from which she emerges so succeedingly. This book is one that made me rethink everything I knew about Nazi Germany, and it is one that I will keep forever and read time and time again. WHERE THE RED FERN GROWS by Wilson Rawls. I first read this book when I was eight, and I have loved it ever since. For the first few years when I never really understood everything in it up to today, I have loved this book. I bought it at a bookstore and read it so much that pages were falling out. I finally got a new copy, which I am pretty much in the process of wearing down as well. The characters and the plot of this are just as inspiring as The Book Thief, just in a different way. A VOICE IN THE WIND by Francine Rivers. See, I'm not usually a religious reader (Even though I am religious). But someone I knew recommended this to me when I was talking about reading books from Roman/Greek days, and when I read this, the profound feelings of the book and the scenery, as well as the spiral into corruption that a majority of the characters face... Ahh, my heart. You love everyone in this book, no matter what. THE IRON FEY by Julie Kagawa. (Okay, I cheated and put four in one. So sue me!) Julie Kagawa is, as I said in my previous post, one of my favorite authors. These books face the light, the dark, the gray, and the unseen and unacknowledged of our world. It makes us realize how our everday decisions affect the lives of those who we consider unreal. But you know what? They are real. I actually do believe that. And Julie Kagawa puts those beliefs into a series of books—you know what? I. Am. SOLD! I think I'm gonna call it there. (: CONGRATULATIONS!! "Curiously dark and entrancing..." I LOVE IT! You should do ALL my press! :-) Dig your diverse listing of faves! I love The Book Thief - I haven't heard of the others, so I'm off to search for them. @Annalisa: Yaaay! Go for it! Recognition for those who refuse to live in the real world? Now *that's* an award I'm giddy-proud to win! Thankity-thanks, Kendra! I'm looking forward to getting started on my acceptance post. ...Oh, and Will's waving his arms from behind the sound-proof partition of my mind and mouthing something amounting to, "Hello, Ashley!" Ashley: *Snickers and waves back* Hiya, Will! A-a-and the acceptance post is up! And I continually to laughingly/despairingly shake my head. Thank you for including me on your list. I have enjoyed a few of the same books as you but OH! how I truly love Where the Red Fern Grows!!! Another Red Fern lover! Fantastic!! :O That's probably what my face looked like the moment I saw what you had gifted me! My very first award!! Thank you so much.